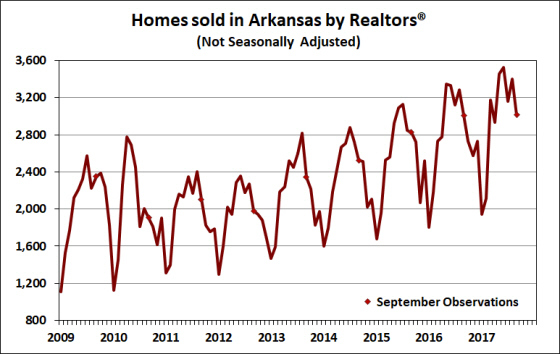 The latest statistics from the Arkansas Realtors® Association show a small increase in Arkansas home sales in September. Sales of new and existing homes were 3,103 for the month, up 0.1% compared to the previous year. For the first 9 months of the year, sales totaled 27,106, up 4.4% compared to same period in 2016. As shown in the figure below, September marks the start of the end-of-year slowdown in home sales. If sales during the remaining three months of the year turn out to be unchanged from 2016, the end-of-year cumulative total for 2017 would still be up by over 3%. After seasonal adjusting the data and aggregating from monthly to quarterly data, the underlying trends are more readily observed (see below). Although the seasonally-adjusted third quarter figure represents a decline from the first half of the year, there is no clear evidence of a persistent slowdown. Nevertheless, with the sales pace having recovered to pre-2007 levels, it would not be surprising to see some leveling-off of sales growth in the near future. 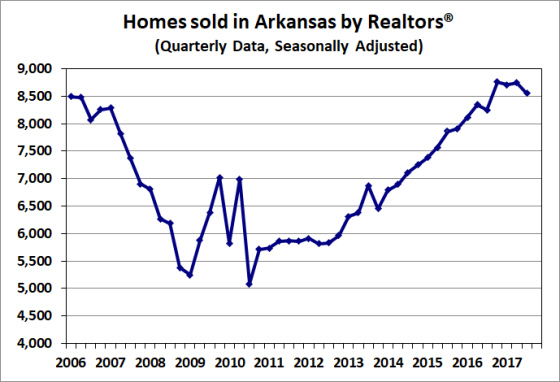 Source: Arkansas Realtors® Association. 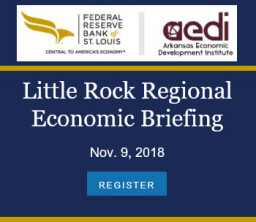 Seasonally adjusted by the Arkansas Economic Development Institute.